Yesterday afternoon, I was kicked out of the tribe for voicing my concerns that Teal’s healing methods could lead to False Memory Syndrome, and for linking to this article by Michael James. For those of you who never got a chance to read it, my post is below, followed by a summary of the events leading up to the removal. For those of you who already know what happened, you might want to scroll down a bit. I received many thoughtful comments. Naturally, some of you strongly disagreed with me for holding Teal accountable, but every single reply was respectful, and I felt that my words gave way to some wonderful conversations and insights. Knowing that I was bringing up a very controversial and emotionally charged issue, I felt pleasantly surprised and very appreciative of the overall response. Thanks, everyone! Yesterday morning, Teal left a few comments below my post. I replied to her soon after. Notice how she refers to Mr. James as a friend. Immediately after I wrote this second comment, I couldn’t view my post anymore. I realized that I had been kicked out of Teal Tribe. Wow. Why? My post was controversial, but I had been kind and polite to everyone. There hadn’t been any arguments. It happened so fast that I don’t know whether Teal even read my replies. Teal says she wants a constructive conversation. Why did she delete my post and remove me from her group without responding to me? I presented my thoughts to her respectfully, asked a genuine question, and I even thanked her for commenting. How has Teal demonstrated that she truly is “more than willing” to discuss challenging topics? Can you think of specific examples where she has dialogued openly and transparently with outsiders who do not necessarily share her views? When she replied to me, Teal referred to James as a friend of hers. Minutes later, she called him a hater and insisted that he was bashing her for publicity. What changed her mind? Does Teal’s follow-up post make any sense to you? How is this hateful? It doesn’t seem like James has anything personal against Teal. The article has nothing to do with her, right? 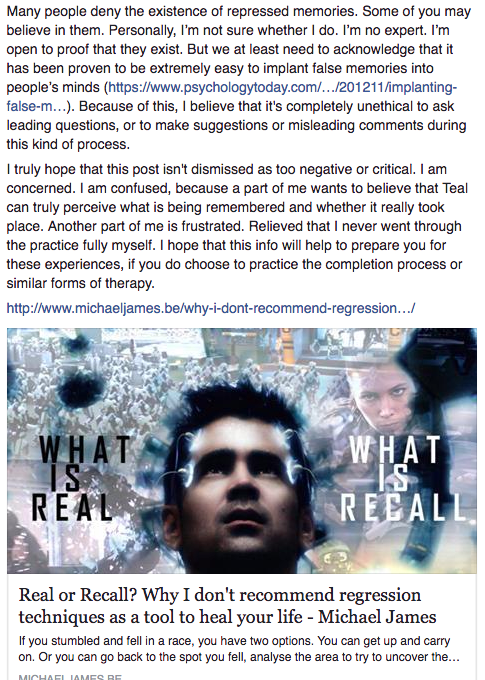 Teal shared her thoughts on regression in general in response to James’ article, but she only dedicated one sentence to the anonymous woman who I believe has False Memory Syndrome. At the end of her fourth comment, Teal insisted that this woman would not be so troubled if she hadn’t been abused. (This statement isn’t visible in my screenshot. Sorry about that. The post was deleted and I was banished before I had a chance fix it.) 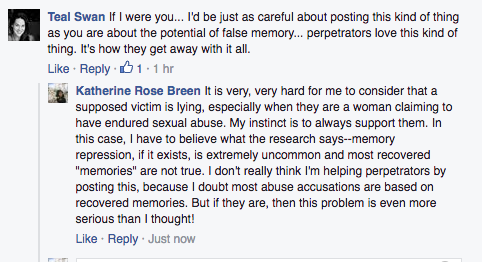 Why didn’t Teal address this issue more clearly, or defend the role she played in the woman’s memory recoveries? Teal loves authenticity and strongly resists those who try to “censor” her, even when her words reveal private information about others and portray them in a negative light. She says that her message is never hateful and her intent is never malicious (though, I’m not sure Ale’s ex-wife and the women described here would agree). Was my post hateful or malicious? More importantly, how radical is Teal’s concept of authenticity if she is the only one in Teal Tribe to reap its full benefits? Many people who once worked with Teal closely have fallen out with her in recent years. Cameron. Jared (“Fallon”). Sarbdeep. The couple from the Czech Republic. Michael James. (There are probably more that I’m forgetting right now.) Some of them have spoken out publicly and their stories often match. Are they haters? Are they lying? If we discover that a spiritual teacher’s techniques have caused unintended harm, if we find out that some of their methods are questionable, is it hateful to warn the community and ask for others’ opinions? Do you want to be a part of a community in which you are not allowed to warn other members about risks, danger, or unethical practices if the warning happens to wound the leader’s ego? Have you ever seen Teal admit to a mistake or offer an apology? Thanks for reading, everyone! I hope you will consider these questions. Though I have spoken critically of Teal, I do wish her the best. It saddens me that she is so easily hurt, and that she seems to bring so much drama upon herself. I haven’t posted this to complain about the injustice of my removal. I no longer want to be a member of Teal Tribe, though I hope to keep in touch with many of you. I just wanted to document the incident and and share my perspective, to provide some contrast to Teal’s deflection. Many of you won’t agree with me, of course, and that’s okay. Update: Why am I blaming Teal? How serious is the risk of FMS? Who is Barbara Snow? 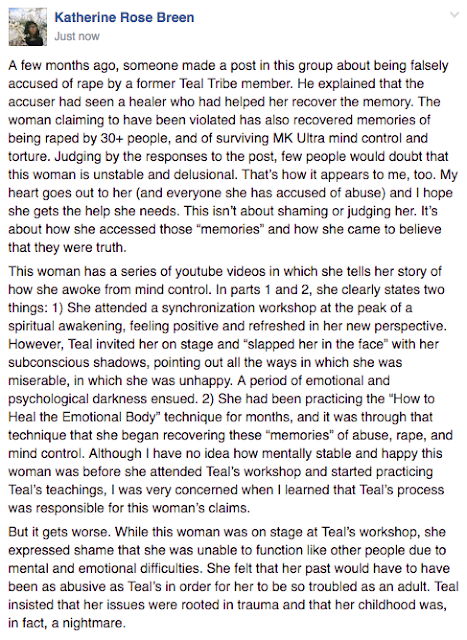 I’ve realized that I haven’t backed up my claims about Teal’s methods very thoroughly. A few people who have commented in Teal’s defense seem to think that I’m jumping to conclusions and “slandering” her. For those of you who don’t feel that Teal should be held responsible, I want to say that there is no doubt in my mind that she played a major role in this. 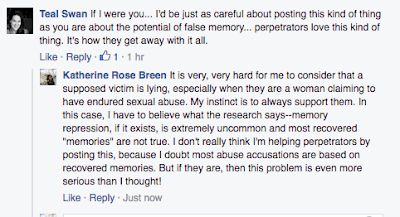 The woman I mention in my original post has stated in Teal Tribe that Teal’s advice (“What if I told you there’s a hell of a lot more you don’t remember?”) actually caused her to wonder whether a particular family member had abused her as a child. This post should still be available in the group if anyone doesn’t believe me. I have no doubt that Teal’s words affected her deeply. We meet with spiritual teachers because we trust their guidance. We believe in their wisdom and power. As followers of Teal, we believe that she is a special soul who has overcome enormous obstacles to find happiness and stability. We believe that she can see our thoughts, our energy, and our futures. Because she tells us that she can. Of course this woman took Teal’s advice seriously. Of course Teal’s words influence her followers. Is it so wrong to expect her to use that influence carefully? The Problem of Leading Questions explains the risks of asking leading questions to a subject under hypnosis. Teal goes much further than asking leading questions in this video. 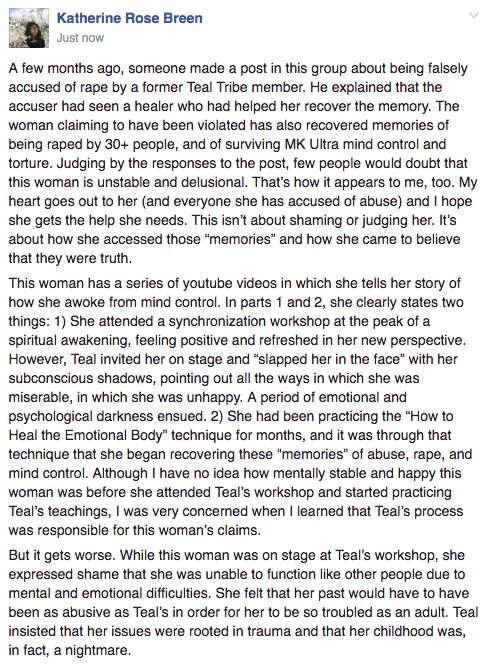 The woman I refer to in my original post was not in a state of hypnosis or meditation while Teal was giving her advice, but Teal’s guidance was obviously intended to directly influence her conclusions about her past. Current Scientific Understandings About How False Memories Can Form, from the False Memory Syndrome Foundation. Making Memories is a documentary on the dangers of Recovered Memory Therapy, a practice that appears to have a lot in common with Teal’s process. Recovered Memory Therapy (RMT) on ReligiousTolerance.org. One therapist named Barbara Snow allegedly implanted false memories of satanic abuse and military testing into the mind of her sister-in-law and persuaded her niece that her father had molested her, in addition to several other forms of unprofessional conduct. If the name Barbara Snow sounds familiar to you, it may be because she has already been mentioned here and here. Because Teal Swan was her patient. The fact that Snow treated Teal has been verified in private conversations, which can’t be published, unfortunately. But I am certain that Snow treated her. And it appears that she may have inspired some of Teal's techniques. Great post. Further proof that Teal has set up a cult. Many followers of Teal and members of Teal Tribe are people with issues looking for esoteric answers to their problems. Teal provides them with what they want to hear ("feel good" answers like a drug). hey guys! LaVaughn thx again for this great article! did you see this Youtube video from on of her followers? Oh BTW specially read the comment section , you ll see that there are alot of people waking up ! really good to see that! I had seen that video. It's heartbreaking. And, yeah, nice to see comments from people who are also waking up to teal's shenanigans. But, a lot of those comments were just hard to read. Cruel. The poor gal's in pain and they just poured salt in the wound. But, I am frequently shocked by YouTube comments. Just no sense of humanity. I'm glad I've taken a year long break from Teal. I just forgot to read her blog and her YouTube videos are the most boring thing. I'm just frustrated that not only did I get heavily involved in the SGI, a type of Buddhism recognized as a cult on their wikipedia page, but Teals stuff too. Its sad that her ideas of emotional authenticity have helped me, but I've tailored and altered them a lot. I don't believe in 100% authenticity, I believe in looking at each situation individually and then making the decision whether or not to divulge. Does anyone know of any non-cultish inspirational/new age/help for psychological trauma that works? Books written by doctors are kind of difficult because they are written from the perspective of someone who hasn't suffered. Any ideas?